Let's keep the Halloween love rolling. 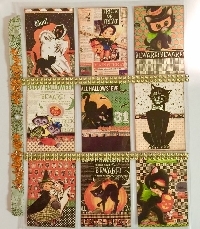 For this swap you will create a Halloween pocket letter using vintage or retro imagery. The front of each pocket should be embellished. The back does not have to be decorated, but insert pretty paper so its not plain. You can insert a few goodies and a note if you like, but the emphasis should be on the front of the pocket letter. If you use images from the internet, make sure they are not pixelated and don't have any watermarks (copyright marks) on them. For this swap you must have completed and been rated for at least 20 type 3 swaps. I will remove any known double-profilers or those with recent 1's. Basically it is like 9 ATCS sent in a page protector except the cards do not have to be as elaborate as ATCs. They started as a way to penpal, but a lot of people (this swap included) treat them more like art.